Question: Recently my water bills appear to be rather high. None of the faucets appear to leak. What else could contribute to a high water bill? Answer: You may want to check to see if a toilet is leaking. First, check the water level to ensure that water is not overflowing the tank by way of the overflow pipe. This is the pipe in the middle of the tank. It has a small tubing connected to it. If water is running into the overflow, adjust the fill valve to stop the flow approximately 1 inch below the top of the overflow tube or to the water level mark stamped on the side of the tank. Second, put a few drops of food coloring into the tank to test the flush valve mechanism. If the water in the bowl changes color within 15 minutes, this is an indication that water is leaking into the toilet bowl and that the ball or flapper needs to be replaced. Answer: Septic systems should be inspected and pumped a minimum of once every three to four years. You may not be experiencing any problem now, but a full septic tank may allow unwanted solids to flow into the drain field, which is the part of the system that consists of a distribution box, with a series of connected pipes. Each pipe allows water to flow into a bed of stone that drains into the ground. If paper and other solids flow into the drain field it becomes blocked and ineffective. A blocked drain field is costly to repair or replace. Answer: Most people are comfortable with their hot water set at 120 degrees Fahrenheit, which is also the new standard that manufacturers use when pre-setting it at the factory. If you have an older model, set the thermostat at medium. On a gas model, there is a dial on the front of the gas valve. On electric models, the thermostats (there may be two) are concealed behind the two panels on the side of the tank. NOTE: Turn off the electricity before removing the panels. There are exposed wires behind the panels containing HIGH VOLTAGE. Answer: Foul odors occur from a buildup of food debris within the disposer. To eliminate this odor, place ice cubes and lemon or orange peels in the disposer and run for 30 seconds. Next, squirt a little liquid dish detergent into the disposer while it is still running. Finally, run cold water for about 30 seconds to rinse all the debris away. Question: I am getting a foul odor from a bathroom in the basement. We hardly ever use this bathroom except when we have company. This is embarrassing. What can we do? Answer: Plumbing systems are designed to prevent foul odors from entering the house by means of the trap attached to fixtures. Traps contain water to seal out foul odors; if the water seal evaporates, the odors enter the house. To solve this problem, pour a bucket of water in each trap, sink, shower and floor drain. This will prevent the odors from entering the house. Answer: The unsightly buildup is mineral deposits. To remove these deposits from the showerhead, take a plastic bag and pour a cup of vinegar in it. Place the bag over the showerhead and use a twist tie to hold it in place overnight. In the morning, remove the bag and use an old toothbrush to gently scrub off the deposits. You might be able to remove the aerators from the faucets and allow them to soak in the vinegar overnight. Question: When I am in the laundry room and the water heater is operating, I hear a rumbling sound coming from the water heater. What could cause this? Answer: Rumbling sounds coming from a water heater are an indication that sediment is built up on the bottom of the water heater. What you are hearing is water that is trapped in the sediment and is boiling. This is an indication that the water heater is not operating efficiently. Sediment will not allow the heat to transfer to the water in the tank, which sends the heat up the flue. Question: I am hearing a whistle sound that seems to be connected to the plumbing system. It comes and goes at times, but I can't find the cause of it. What could cause this? 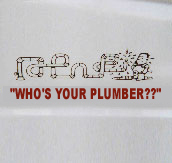 Answer: The sound you are describing is usually caused by a toilet fill valve that is slowly leaking. To locate the leaking toilet, remove the lid of each toilet tank and adjust the fill valve mechanism until it stops. Once you have found the toilet causing the problem, repair or replace the fill valve. Question: We need to replace a toilet in our home. We have heard coworkers and friends complain that the new toilets do not flush properly, and that they require multiple flushes. What is the recommendation for toilet replacement? Answer: When the federal government mandated that new toilets use no more than 1.6 gallons per flush, manufacturers had to develop a toilet that would achieve this but that would also flush properly (clear the bowl) and carry the waste to the city sewer or septic system. Some of the early models did not do this properly. Since then, the complaints have forced the manufacturers to develop new ways of flushing toilets. One new way is the use of a pressurized toilet tank. This model looks like a regular toilet, but it has a pressure tank inside. When flushed, it works like a commercial toilet. A large surge of water enters the bowl and clears the bowl of any waste. These toilets work well, but are not as quiet as a conventional model. Question: There are four people in our house, two adults and two teens. We are constantly running out of hot water. After a five-minute shower, the water starts to turn cold. This change occurred quite recently. Help! Answer: There are two possibilities. First, the dip tube has broken off. This is a tube that forces incoming water to the bottom of the tank so that hot water will be drawn off of the top. When the dip tube breaks, cold water entering the tank mixes with the hot water and cools it down. This can occur in both gas and electric models.